On October 27th, the Catalan parliament honoured the result of the independence referendum held on October 1st by voting in favour of a unilateral declaration of independence. Within hours the Spanish Senate in turn voted to invoke Article 155 of the Spanish Constitution to suspend regional autonomy and dissolved the Catalan Parliament. Prime Minister Rajoy immediately called for regional elections to be held on December 21st. Things are rather complicated at the moment. We’ve had a “coup d’etat” by the Spanish state (government and lawcourts working together; no independent judiciary here), although of course from their point of view, it is the Catalan side that have staged one of those. Whichever way, I don’t think the Catalan leaders deserve to be in custody (this could mean up to four years before trial), and even less go to prison for up to thirty years if found guilty (which they might well be). To me this means that anybody, not just them, can be put in prison for their political ideas, whether they’re peacefully demonstrating, or striking, or whatever. Anything can be judged as “sedition” these days. Something else that has happened is that Catalan self-government, which is in fact older the Spanish constitution, has been suspended, and we may not get it back after the election. The Spanish government have made it clear that it all depends on whether the “wrong” side win or not. Rigging is definitely on the cards. In the meantime, freedom of expression is being curtailed, sometimes in bizarre ways: for example, yellow lights in public fountains have been banned, because they evoke the yellow ribbons that independentists wear as a protest against the arrests. And school teachers who dared hold debates in class about the police violence on October 1st have been taken to court for it. What gets to me is that many people refuse to see how worrying these things are. I suppose normalizing it all is a survival strategy, since the alternative, i.e. being aware of what’s going on, makes one anxious and afraid. I don’t know what polls you looked at, but the ones that newspapers of all tendencies have published here say that it will be a close thing between Esquerra Republicana and Citizens. I’m sending you a link to an article in the Financial Times (sorry about the rotten source) that presents the data as it has appeared in Spanish and Catalan media. I don’t have a clue how valid the polls are. All I can say is that most newspapers in Spain are right wing, so if all these right-wing media (including FT) are saying the independentists have a good chance of winning, maybe they will win. On the other hand, they might be deliberately exaggerating the independentists’ chances in order to encourage unionist participation. Who knows? The one thing that’s clear to me, in answer to your question, is that if the independentists win, they won’t be able to go ahead with their separatist agenda for the simple reason that their leaders are either exiled, or in prison, or on bail under promise not to break the law again, or indicted, or about to be indicted, or in the case of CUP (the radical independentist party), quite likely to be made illegal. In fact they haven’t even been able to talk much during the election campaign, since saying certain things would mean an arrest. It’ll be quite an act of protest on the part of Catalan voters if they win, given these circumstances; and in fact this is why, for the first time in my life, I’m going to vote for Esquerra Republicana. But it will be a symbolic act and nothing else. Something else that may well happen is a rigged election. I know this sounds weird and impossible in a European country, but a lot of weird and impossible things have happened over here since last September, so if I’m paranoid, it’s not without some justification. For example, the IT company hired by the Spanish government to count the votes is one that already raised suspicion when in the last Spanish election (the one that had to be repeated) Podemos lost about one million votes in six months. Apparently this company have close ties with Partido Popular and have been appointed arbitrarily and without following due procedure. The rumours of rigging are so widespread that there will be the largest number of voluntary observers in polling stations ever. But what happens once the data is sent to the central system is more difficult to keep track of. 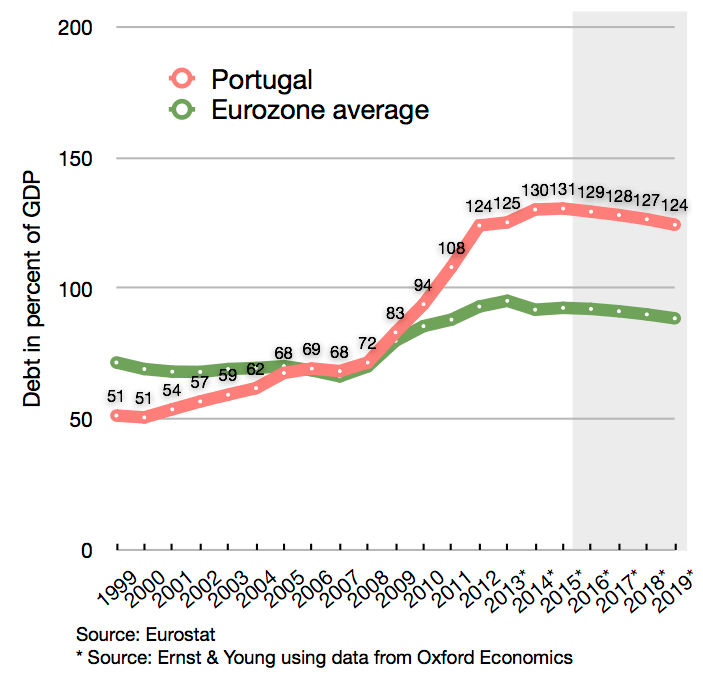 Would it really be so difficult for the Spanish government to alter the results? Finally, I’m not surprised that May is backing Rajoy and that the media have stopped being interested in us. We’re after all of no economic or strategic importance to anybody. And I guess from the point of view of the rulers of Europe, having authoritarian regimes ruling peripheral countries like Spain or Greece can only be a good thing. After all we had Franco for forty years and nobody batted an eyelid, so long as the US could keep its military bases in the peninsula. I don’t think things have changed that much. It’s really important to understand that despite the fact that what—despite what happened yesterday, where the pro-independence parties continued to hold onto a majority of seats, this judicial process is continuing. In fact, this very morning, so the morning after the elections, the Spanish Supreme Court announced that it was further indicting a bunch of other leaders of the pro-independence movement, of all the different pro-independence parties, as well as the civil society movement that has been supporting independence. And you can describe this as a kind of McCarthyism, where what is, in principle, a legitimate political position, which is the idea that Catalonia is better off on its own as an independent republic, has become criminalized. And in the same way that in the 1950s communism was a reason to persecute political ideas, the same is happening now in Spain, where the judicial branch of the Spanish state is applying pressure and sort of setting boundaries to what is sayable and thinkable politically. Rajoy has said already, this morning in a press conference, that he is not going to talk with Puigdemont anywhere. Rajoy, in his typical stubborn denial fashion, has said he is not going to do that. It’s really—one could wonder how long this attitude of Rajoy, this kind of denialism of Rajoy, can withstand reality, the political reality of the fact that at least about half of people in Catalonia do not see the Spanish state as their state and want to leave. 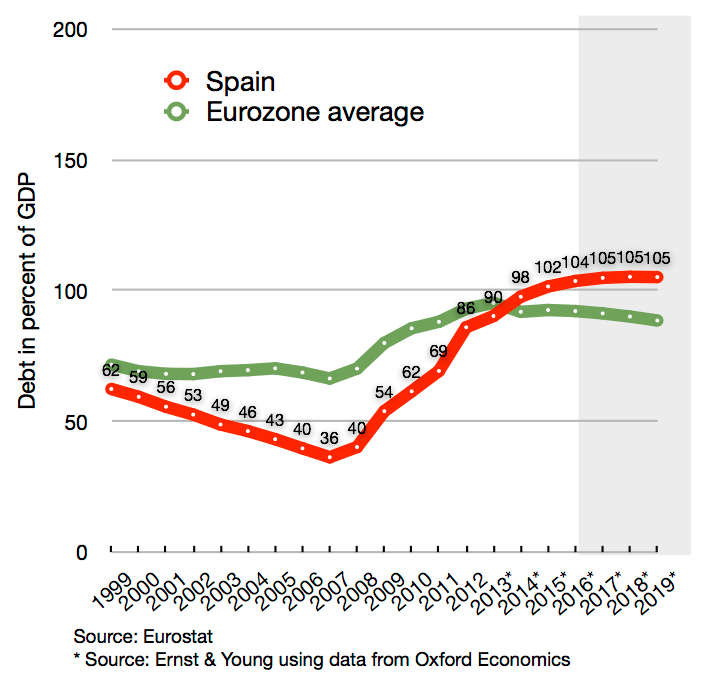 It’s really unclear whether Rajoy can keep this up, but he’s going to, for sure, try. Currently, the Catalan self-government continues to be revoked. Rajoy said this morning he will—the self-government will be reinstituted as soon as a new government has been formed. And now the question is whether the three pro-independence parties will be able to actually form a government. They do have a majority of seats, but there’s three of them, and they don’t see eye to eye on everything. So it’s still up for question whether this government can be formed. And it’s up to question how the government will look, because of the 70 pro-independence deputies that were elected yesterday, eight are either in exile or in prison currently. Click here to watch the interview and read a full transcript at the Democracy Now! website. 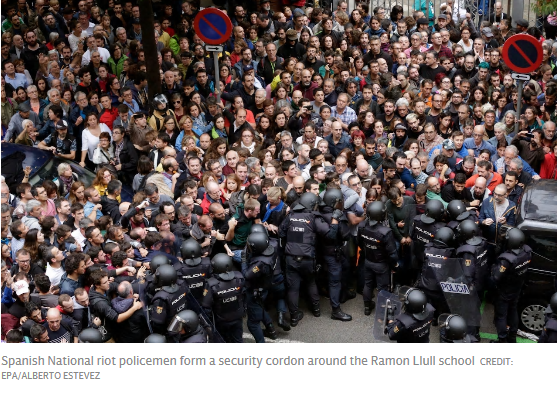 On Sunday, all across Catalunya ballot boxes were ripped from people’s hands by masked police and a dangerous violence was unleashed, at random, upon some of the 2,262,424 people who stood in long lines to cast their vote. The repression dealt by the Spanish State to prohibit the Catalan Referendum, in every bloodied baton and ever rubber bullet, transformed the day from a question of independence to a question of democracy. People were voting for the right to vote. writes independent journalist Kevin Buckland, who provides eyewitness testimony of the Spanish government’s savage determination to thwart Sunday’s referendum in Catalonia. I am sitting on the floor of the polling station in central Barcelona, a long line has grown behind us. We have been here for hours already, but it doesn’t bother us. Just by being here we are useful. The rain has slowed to a drizzle and faces are emerging from beneath the umbrellas. It could be the line of people waiting to see a movie, young couples, the middle-aged with their adult daughters, families with children — these are not protestors, these are people. There is a nervous tension, as we wait we are seeing realtime images of polling stations that look exactly the same as ours having their doors kicked in, people pulled away by their hair, elderly women thrown down stairs; twitter is a scroll of police clubs and rubber bullets. In some places the hundreds of people, with arms linked or hands in the air are enough to turn back the police, in others masked men walk out of schools holding half-filled ballot boxes. Please take a second to imagine this: you go to your usual polling station and, as usual, you wait in a short line to vote. As you wait, masked men in dark armored suits smash their way in, pushing the elderly, clubbing your neighbor and firing rubber bullets into the crowd. They grab the ballot boxes and march out. They steal your vote; steal your voice. Twitter says there are 234 people injured. This is the largest act of civil disobedience I have ever seen, and the bravery it required of the everyday people should not be diminished. Just by standing in that line we were all risking great harm. We wait our turn, patiently and calmly, but nervously. We pass the time by chatting to those next to us in line. The woman in front of us tells us of the first time she voted after fascism ended; of the student protests and the police brutality. In a country with such a recent history of dictatorship, voting means something different for the older generation. The crowd cheers after an elderly woman walks past the long line after voting, she claps her hands in joy and the crowd joins her. Having spent most of her life under fascism, democracy must taste sweeter. I see the woman in front of me wipe away a tear. The crowd cheers next for a old man in a wheelchair and a young couple with their baby, the noise follows each of them from the polling station. We cheer for everyone, not for how they voted, but becausethey voted. This has become about more than independence, it is about the right to vote; the right of a population to ask itself a question and to answer it. Click here to read Kevin Buckland’s full report of the day. Click here to read Richard Sudan’s full report. In the days leading up to the referendum, corporate media outlets with few notable exceptions (RT, Al Jazeera and to some extent the Guardian), uncritically repeated the pro-Madrid mantra that the independence election was unconstitutional and thus illegal. Here was the patina of legitimacy for what would quickly follow. Repeating it meant promoting the Spanish government’s pretext for violent suppression. It justified the media’s collective decision to downplay an already impending paramilitary crackdown against a peaceful movement. Note the caption specifically puts the agency for the “clash” on the people. 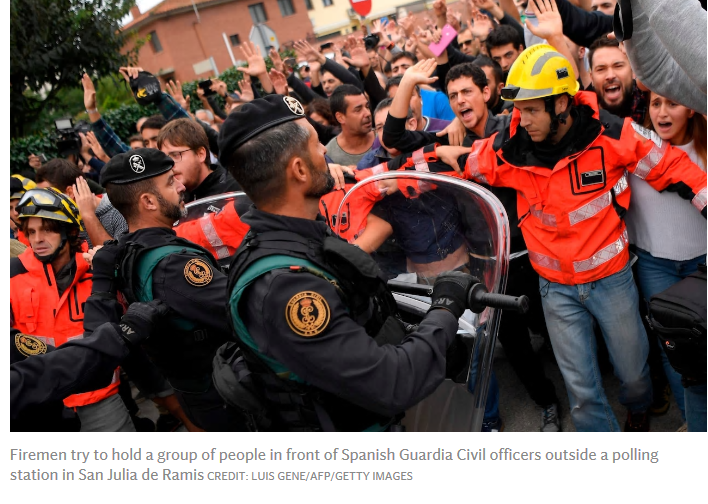 “People clash with Spanish Guardia Civila…”. But the picture shows something very different, a voter being manhandled away from the polling station. 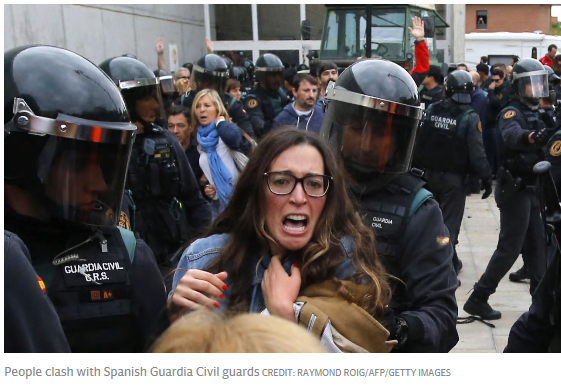 When Spanish President Mariano Rajoy deployed thousands of police forces to Catalonia to repress an illegal referendum for independence, he probably thought it would bring some closure to an open issue. Perhaps, enforcing the law violently on peaceful citizens who just wanted to cast a vote, and doing it on the global stage would finally convince those rebellious Catalonians that their cause was lost. Far from closure, the events of 1 October 2017 will cause more consternation in Catalonia than ever before. It is fair to question if Catalonians live in a 21st Century democracy, whether their most basic human rights are going to be respected and whether there is any room for political dialogue. Many of those who were not pro-independence before yesterday but supported a referendum, are probably wondering today whether there is any point in even considering staying in Spain, after all. writes journalist Victor Lasa in another article published by Counterpunch. Make no mistake, this is not a symptom of political idiocy, but a well-thought, effective strategy. Surveys are already showing the PP [Partido Popular, the ruling party in Madrid] would win the government again, by a landslide. The PP thrives in conflict, and Catalonians served them one on a silver platter. Why resolve a conflict when you can benefit from it instead? This is classic Real Politik applied within its own borders. By simplifying and trivializing, they polarize the electorate, perhaps leaving almost no chance for those who show moderation and relative impartiality, like center-left PSOE and Podemos. On the other hand, this conflict is the perfect attention deviation device. One they desperately need to divert attention from hundreds of cases of rampant corruption, which include the political manipulation of the same national police they sent over to Catalonia. The next time they have a chance, Spaniards and Catalonians will vote with their guts rather than their brains. Nevermind that PP will be reduced to political irrelevance both in Catalonia and the Basque Country. They will have the rest of Spain, drawing a map that paradoxically will make borders ever more obvious. One more question to answer now is how far the PP will go with this strategy. How much can the conflict be managed for political benefit before it explodes into an uncontrollable succession of violent events. It looks like we could find out soon, as the Generalitat [government of Catalonia] prepares itself to unilaterally declare Independence in the following days. Click here to read Victor Lasa’s full article entitled “Catalonia and the Unsustainable Strategy of Conservative Spain”. MU: But do you think the police in every case – pushing women downstairs, firing rubber bullets into polling stations – do you think they have used proportionate and legitimate force? AD: And if there was any use of force it was a limited one and prompted by the fact that the law and order agencies were prevented from discharging the orders of the courts. AM: You’re saying that those pictures that people saw of Spanish police intervening aggressively in polling stations are all fake pictures – they didn’t happen? AD: I’m not saying that all are fake pictures but some of them are. And you know there has been a lot of alternative facts and fake news here. And as I said, if there was at all – and according to the pictures there was – some use of force it was not a deliberate use of force. It was a provoked use of force. You can also watch the same interview on BBC iplayer by clicking here. Last June, a referendum was called on whether Catalonia, an autonomous region of the northeast of Spain, should declare itself to be a fully independent country. On September 6th the Catalan parliament approved this referendum and set the date for October 1st. It also introduced a law which states that independence would be binding with a simple majority. The Spanish government has ruled the referendum illegal. The president of Catalonia, Carles Puigdemont, writes in the Guardian that “a de facto state of emergency” has ended Catalan home rule just weeks ahead of a planned referendum on independence. Madrid appears deaf to the argument that its heavy-handed attempts to stop the vote will only ultimately strengthen support for secession. A judge sent in the police to arrest a dozen local officials; the Guardia Civil seized millions of ballot papers; the central finance ministry took over the region’s finances to prevent public money from being used in the vote. All the Spanish prime minister, Mariano Rajoy, has achieved by being so oblivious to public sentiment in Catalonia is to harden opinion in the region and draw thousands onto the streets. The paragraph above is taken from the Guardian editorial published last Thursday [Sept 21st] entitled “The Guardian view on Catalonia: step back from the brink”. About reports that a state of emergency has been put in place, they’re not totally wrong. Officially, such a thing hasn’t happened, because it would require approval by parliament, and Partido Popular [the governing party in Madrid] haven’t got enough of a majority to push this. But in practice civil liberties are being trampled on in various ways. Fourteen officials working for the Catalan government were detained yesterday, and interrogated for a whole day without the presence of their lawyers. The headquarters of an independentist party were surrounded for eight hours by the Guardia Civil (Spanish military police with an infamous Francoist past) without a court order. The Catalan government’s finances have been forcibly put in the hands of the Spanish government. The banks have connived in this, blatantly against the law, since no there is no court order to close down the Catalan government’s accounts. Although by law we have our own Catalan police, we have been invaded by the Guardia Civil and the Spanish Policía Nacional, who have arrived in large numbers; and more are stationed in boats in the port waiting to act. A few days ago over 700 town mayors were simultaneously indited for their support of the referendum, and now face criminal charges, like the arrested officials. Freedom of expression has been curtailed, since it is now a crime to publicly call for participation in the referendum, though Catalan public media keep ignoring the order. The latest news is that school directors (most polling stations are schools) have been declared liable if they allow the vote by handing in the keys to the buildings, and police will be sent to each individually in the next few days to threaten them with criminal charges if they don’t comply. Also, school directors are supposed to inform against their superiors in the Catalan Department of Education, and again, they’re liable if they don’t. All websites informing about how and where to vote have been seized by the Guardia Civil. Even printing voting cards has become illegal, and private printing presses have been raided, the material confiscated and the owners indited. I find that one of the most depressing aspects of what’s going on here at the moment is censorship, which everybody looking for information on the referendum has experienced in the last few days. It feels weird to look up a website and find it has been replaced by the threatening logo of the Guardia Civil (complete with an axe and a sword) and a message in Spanish and English informing that the website has been “seized pursuant to a warrant by the Judicial Authority”. And just this morning I heard that charges are being brought against activists who set up mirror websites to circumvent the ban on referendum advertising. Click here to read more about Spanish government’s denial of access to a free and open internet. Public statements condemning the crackdown have been made by many civil society institutions (Barcelona football club among them), and Podemos and other associated left-wing parties (both here and in Madrid) have done likewise and are now backing the referendum as a protest act, although they are not independentist and would prefer an agreement with the Spanish government. Also, a lot of ordinary citizens are defying the Spanish government’s ban on referendum advertising, by pasting home-made posters wherever they can. The Catalan trade unions are beginning to talk of a general strike. The Catalan government and the pro-referendum parties have called for peaceful resistance and so far there hasn’t been violence on the part of protesters, except for a couple of minor incidents last night that have been wildly exaggerated by the Spanish media. But the situation is tense since a lot of us feel outraged by the totalitarian measures imposed by the Spanish government. To be accused of being an agent of sedition is a privilege when the accuser is someone obsessed with using the law to confront democracy, when he seeks refuge in an article of the constitution, number 155, brought in an envelope to the authors of the constitution by Franco’s military, when they say to us, whatever we decide to do, their documents will always carry more weight than our hands. It could very well be that we’ve waited too long to confront them. Be that as it may, the taboo of burying our differences can no longer hold up. It is the people that decide such things, not an old and decrepit law that we neither respect nor recognize as our own. I’ll go even further. To be a seditious person today is, for them, to take an unforgivable position. Those that accuse us of sedition in this way or that are really only trying to maintain the privileges of a corrupt regime that is, for the first time, being seriously challenged. I’ll never be able to close ranks with people that say things like, “he who breaks it, pays for it” as they cynically cover up the fact that their party is the most corrupt political party in Europe, while among their ranks are hundreds of people that have never been held to account for the things they’ve done, while they break the hard drives where the evidence of their crimes are hidden without the least fear of consequence, while they violate the Constitutional separation of powers and use state institutions not only to serve the needs of the Prime Minister and his cabinet, but even worse, the proprietary needs and desires of the their party. Click here to read the same article (translated by Thomas Harrington) in Counterpunch. I agree with the sentiments in the Counterpunch article, and the facts reported in it are true as far as I can tell. What I find missing is some criticism of the independentist side, especially of the Catalan government’s strategy, which has been rather questionable, and of their ulterior motives, which are not being discussed enough. But I guess having reached this wretched point, any democrat’s priority should be to denounce the Spanish state’s totalitarian measures, rather than point out the wrongs or the weaknesses of the more vulnerable side. My position at the moment is that of Podemos and other associated left-wing parties: the referendum must be held because this has become a question of civil liberties and human rights. However, under the current circumstances, it will be impossible to hold it with all the proper guarantees, so it should be considered a protest act rather than a binding vote. In my case, if polling stations are open, I’ll try to go and put in my vote, even if it is a blank one, just to affirm the sovereignty of the Catalan people and my individual freedom of expression. But whether this will happen at all is looking less and less likely. On September 27th, the Guardian published an op-ed written by the Mayor of Barcelona, Ada Colau, entitled “Europe must act to protect the rights and freedoms of Catalans”. By proving itself incapable of finding a solution during all this time, the Spanish government has allowed the Catalan conflict to escalate from an internal dispute to a European conflict… Europe cannot allow itself to adopt a passive position over the Catalan question, seeing that the events going on in Barcelona are affecting Paris, Madrid, Brussels and Berlin alike. The European Union came about as a project to safeguard and guarantee our rights and freedoms. Defending the fundamental rights of Catalan citizens against a wave of repression from the Spanish state is also the same as defending the rights of Spanish and European citizens. Those of us who are committed to advancing towards a democratic, social and freedom-loving European project find it hard to believe that the European Union’s institutions would not only back a situation that jeopardises fundamental rights and freedoms but also fail to commit themselves to finding the means for a negotiated solution to the conflict. It is for this reason, given the seriousness of the situation in Catalonia, that it is my obligation as mayor of its capital, Barcelona, to call on the European commission to open a space for mediation between the Spanish and Catalan governments to find a negotiated and democratic solution to the conflict. Click here to read the full article by Ada Colau. The letter says the online crackdown is part of “the ongoing unlawful repression of the institutions of autonomy of Catalonia” and calls on the commission to act as “the ultimate guardian of the open and free internet, which is truly at stake now”. Asked about the legality of the Spanish authorities’ actions, the commission referred the Guardian to remarks made by its chief spokesman on Tuesday. “We don’t have anything to say other than to reiterate our respect for the legal order – the constitutional order – within which all these measures have been taken,” Margaritis Schinas told reporters on Tuesday. Click here to read the full article entitled “Catalan leaders compare Spain to North Korea after referendum sites blocked”. It’s been five years since the massive occupation of May 15, 2011 that gave birth to the movement of los indignados, 15M. Five years of faltering progress with many advances and set-backs along the way. 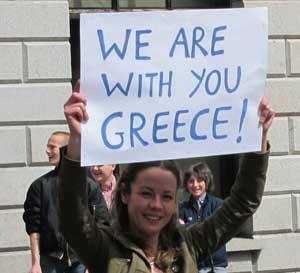 Five years of a tremendous crisis, civil unrest and mass protest. So, what remains today after such a sustained period of outrage? 15M has changed the way we read and interpret the crisis we are facing. We were all told in 2008 that “we live beyond our means”, and blamed for the present situation, but the movement of los indignados has enabled us to change the story. One of its principle slogans, “no somos mercancías en manos de políticos ni banqueros” (we are not mere things to be manipulated by politicians and bankers), pointed in this direction. 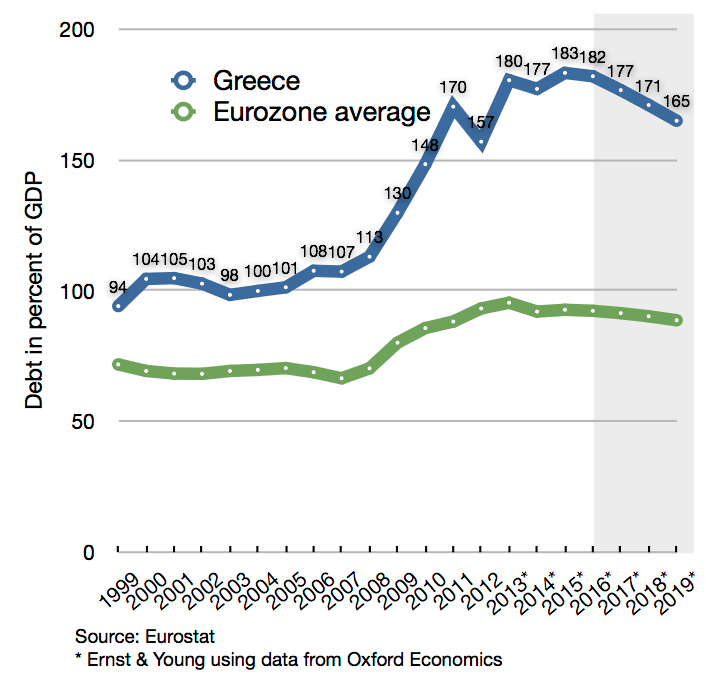 15M said that the banks were the authors of economic collapse, and that most of the political class was also complicit. Los indignados imposed a counter-narrative that challenged the official lie: neither guilty nor responsible, it said, we are victims of an age of corruption. What began as an economic crisis, soon led to a social crisis and finally, under the impact of 15M and the independence movement in Catalonia, to a crisis of the political system per se, which led people to question the founding principles of the (post-Franco) Spanish Constitution of 1978 and each of its pillars, monarchy, two-party system and our state model. This would have been unthinkable not long ago. 15M connected with the seething social discontent and helped to propel it into the form of collective mobilisation, legitimising protest and nonviolent direct actions, such as camping in public places, or occupations of empty houses owned by banks, like the Plataforma de Afectados por la Hipoteca (or PAH – literally: Platform of People Affected by the Mortgage). Potentially illegal actions were now considered legitimate by a significant portion of public opinion. According to several polls, up to 80% of the public considered that los indignados were right and supported us, despite criminalisation and stigmatisation by those in power. Two years after Mareas ciudadanas (the citizens’ Tide), the spirit of 15M finally made the jump to policymaking: moving from “no nos representan” to “Podemos” and the claims of “los comunes” †, having overcome the difficulty of gaining political traction. Even after pundits had accused the movement of being unable to present a serious political alternative and said that the management of our political institutions must be left to professionals. The emergence of Podemos came with the victory of five MEPs in the European Parliament in May 2014, which marked the beginning of a new political/electoral cycle; one that has not yet been closed, and that was further crystallized in municipal elections of May 2015 with victories against all odds, of alternative candidates in local government capitals of Barcelona, Madrid, Zaragoza, Santiago de Compostela, Cádiz… followed by the breakdown of two-party politics (in the General election) on December 20th. This political translation of outraged social unrest simply needed two things: time and strategic boldness. These successes had not been anticipated, and without the 15M movement would not have been possible. Those stuck in “old politics” have been forced to rethink their modes of communication. Some have abandoned ties and put on more fashionable shirts, as step-by-step all kinds of shifts became imperative and the word “change” became ubiquitous in the electoral scene. As if that was not enough, a new party, Ciudadanos (Citizens) was launched, with the aim that social unrest might be railroaded into more harmless channels. Maybe on today’s upset political chessboard the weakest side is the social mobilisation necessary to any process of change. The bid for institutional participation, the setting up of new political instruments and the sudden and unexpected victories in various city councils took place in a climate of social passivity. However, real change does not come about only through conquering institutions, but through gaining support from a mobilised society. If society does not exert pressure on governments for change, it is the powers-that-be that will, and we know whose interests they serve. What remains of all our outrage? A regime in crisis, not ready yet to fall but ready to be reconfigured. As the French philosopher Daniel Bensaïd said: “Indignation is a start. A way of standing up and beginning to walk. One becomes indignant, rebels, and then thinks what next.” This is where we are now. * Article in Publico.es, 15.05.2016. † This is the name used by the candidacy of Ada Colau, elected mayor of Barcelona on May 2015. King Juan Carlos has abdicated — long live the real transition! Since the elephant hunt of his “majesty” in Botswana, through the indictment of his son- in-law Iñaki Urdangarín in the “Noos affair” and the involvement of the Infanta Cristina in this case, and including the many operations on the monarch’s hip, costing millions and paid out of public funds, the Royal House has become a caricature of itself. One of the main justifications of “democracy” is mortally wounded, but it is not dead yet. The announcement of the royal abdication is a final, desperate attempt to save the regime; an attempt at a “facelift” with the aim of restoring legitimacy not only to the monarchy but also to its suite of judges, politicians and opinion formers. For years, far too many years, they have lived under the shelter of this false Transition, trying to efface or hide our collective history. Our forgetfulness has been the substrate of their victory, not only moral but also political and economic. The economic crisis, transformed into a profound social and also political crisis, has put the king and the regime of 1978 on the ropes. People have said “basta”. We saw it three years ago with the emergence of the 15-M Movement; with the spread of civil disobedience; with the occupation of empty homes that were in the hands of banks, and all of that with broad popular support despite the criminalization of protest. More poverty means more pain, but thanks to these mobilizations it also means greater awareness of who are the winners in this situation – the bankers, the politicians – and who are the losers. The rising demand for sovereignty in Catalonia has also thrown the regime on the ropes, highlighting the deeply anti- democratic nature of a Constitution that does not allow the right to self-determination. Today, the European elections have given the “coup de grace” to a decaying regime, with the loss of more than five million votes for the PP and the PSOE and the emergence, with the election of five members of parliament, of “Podemos” . The regime is becoming nervous, very nervous. The royal abdication is the latest rescue manoeuvre. But we must nevertheless remember that the system still has room for manoeuvre. The abdication of the king illustrates the weakness of the pillars of the regime and the strength of the people. But we do not want Juan Carlos Felipe [Juan Carlos Felipe is the Crown Prince] either. It’s time to go out into the streets to demand the opening of constituent processes throughout the Spanish State, in order to decide what kind of future we want. We must go on the offensive in order to checkmate the regime. *This article was published in “Público.es ” June 2, 2014. Translated by International View Point. Victory against Madrid’s hospital privatisation – and other recent struggles in Spain – shows popular resistance delivers results. “Resisting is pointless,” we hear endlessly repeated. “So many years of protest but the crisis continues, why bother?” insist others, inoculating us with apathy and resignation. “Protests could lead to something that’s even worse,” whispers the machinery of fear. They want us submissive, heads bowed. Dreams of change are forbidden. However, history rebels, it is indomitable. And it shows us, despite the naysayers, that struggle is worth it. The victories against the privatisation of the Madrid’s public health system, of the Gamonal neighbourhood standing up to speculators and the corrupt, of the cleaners in their battle for jobs in the capital and the struggle against evictions and the banks, are good examples. The Madrid government’s u-turn on its plans to privatise six public hospitals is one of them. The [Popular Party-run] adminstration in the capital has been forced to revoke the “outsourcing” plan after fifteen months of protest and the announcement of the High Court of Justice of Madrid to provisionally suspend the privatization process on the grounds it could pose “serious and irreparable damage.” There have been months of demonstrations, strikes, a referendum with nearly one million votes against such measures, hospital occupations, lawsuits. The triumph swept away its leading promoter, regional health commissioner Javier Fernández-Lasquetty, who has been forced to resign. It’s worth the fight. The fight against evictions has been, without a doubt, the ultimate expression of a collective rebellion against this con-trick of a crisis. In response to the unlimited usury of the banks, people organized at the grassroots. Over a period of more than four years, the Platform of People Affected by Mortgages (PAH) has managed to stop 936 evictions, rehouse 712 persons in empty properties owned by financial institutions and today occupied under the Obra Social campaign of the PAH. And it has forced many banks to negotiate hundreds of repossessions and social rent. Some will say that is very small progress compared to the overall offensive. That’s true. However, I would put that to all those who thanks to the PAH have a roof over their heads. It’s worth the fight. * Article published in Público.es, 30/01/2014. Translation by Revolting Europe. * Esther Vivas is a member of the Centre for Studies on Social Movements (CEMS) at Universitat Pompeu Fabra. She is author of the book in Spanish “Stand Up against external debt” and co-coordinator of the books also in Spanish “Supermarkets, No Thanks” and “Where is Fair Trade headed?”. She is also a member of the editorial board of Viento Sur.